My imagination has often spread its wings and flown into the beautiful paradise of snow-clad mountains in the Himachal. The vibrant green meadows, the splendid valleys, the gushing rivers and the orchards covered with the richness of fruits have always cast a magical spell on me and compelled me to explore the land of my fantasies. Kasol had left us spellbound the last time, so I decided to explore a unique village this time by the name 'Grahan'. The name intrigued me to step foot on it. I put on my cap of enthusiasm and made up my mind for a 4-5 h trek from Kasol to Grahan. Now, let me begin by telling you a little about the quaint little village which has made a mark in the Kullu district of Himachal Pradesh. The gorgeous trek shall last for around 12 km (one way) and present you with spectacular views to cherish for a lifetime. You shall notice that it is bordered by Kullu Tehsil in the south, Spiti Tehsil towards the east and Lahul Tehsil in the north. I wanted some peace of mind from the daily humdrum of life and this trekking trip served as the best stress buster on the platter of travel. Grahan village is the most charming in the months of mid-April to December and thankfully we had chosen the Christmas month to explore. 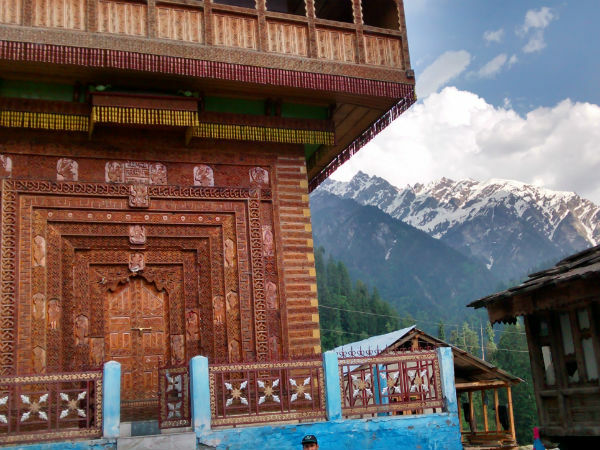 Grahan is around 8 km from Kasol in the Parvati valley. Two of my childhood friends were accompanying me and we were super-excited to be travelling to this exotic location. We started from a bridge near Kasol and with the guidance of a few locals, we started on the right path. It was delightful to have the Grahan Nallah flow to our left and the sparkling waters of spring made our journey all the more wonderful. To top it all, the weather was beautiful and we felt energized to continue our journey. The locals advised us to skip the bridges which were very tempting as they shortened our route but we were said that the path was a really painful one. It took us around an hour to cover 3 km and until then, we had not crossed the Grahan Nallah. We used the makeshift bridge to plonk to the other side after which we were welcomed deep into the jungle and took in a wisp of the adventurous air of the mountains. We did breathe a sigh of relief when we spotted signals and arrow marks towards the village of Grahan which made the way crystal clear for travellers and trekkers. They appeared every 10 minutes and we thanked our stars. The path was slowly becoming narrow and within an hour, our eyes shone on spotting a dhaba. We were certainly famished climbing all the way uphill and the dhaba food seemed like a blessing en route. Having regained our strength, we resumed our journey. After around 30 minutes, there was a signboard which said that our destination was about 1.5 km away. But the track was bifurcated into two and it was for us to decide which way to proceed! I recalled having read something about there being two possibilities. We could either choose to take the longer but easier route or just settle down for the shorter but difficult route. It seemed like such a conspiracy of the direction deity to confuse us. We did stick to the longer route as we did not want to waste all our energy here but save it up to embrace Grahan village with open arms. So, we decided to keep our batteries charged, physically and mentally. We munched on energy bars while we kept following the trail. Soon we could spot the first heavenly Grahan abode. It was an enchanting hamlet of wooden homes and the villagers were so warm and friendly that we already felt at home! We enquired about guesthouses and were surprised to find that the homestays were pretty cheap there and that too including the dinner served for the night. We instantly made friends with a local family who exuded pure warmth. They offered us delicious tea made from herbs in their garden which left our tastebuds seeking for more. We closed our eyes, soaked in the tranquillity of the environment and sipped tea in the loving lap of Mother Nature. Bright smiles never left our faces as we observed the happy chatter around us with a mixed tinge of Hebrew-English-Hindi and the picturesque mountainous landscapes simply left us speechless. The rhythm of the Grahan Nallah never failed to catch our fancy either. Camping on the open grounds was also an excellent option as you could spend the night gazing at the stars and feeling satisfied. It is true that the moment you turn off your phone, you log in to the admirable greenery here! The network connectivity was weak in Grahan but that did not deter us in forming a strong bond with the place. It gave us pure solace seeping in the breathtaking blue skies while the barley and wheat fields, children playing and female carrying fodder for their cattle, all of it seemed surreal. The image in front of our eyes was that of colorful trees, snow-covered peaks and fascinating forests. We walked along the village of Pulgi and our eyes met a small temple right in the heart of the village but, unfortunately, we were forbidden entry into it as we were outsiders. This part was actually referred to as New Grahan. It was nearing nightfall and our stomachs were making rumbling noises yet again. The locals were the most hospitable people we had ever met as they served us the most scrumptious meal I had had in a long, long time and before parting ways back to Kasol, a bonfire was set up to celebrate our togetherness. We interacted with a lot of locals and shared stories from every corner of the world and packed a lot of memories to take back from the village of Grahan! It was a wonderful trek which made a place in our hearts and shall stay there forever. The weather was pretty cold and so, do remember to carry a sweater or two when you visit here. Rajma chawal seemed to be the best cooked by the people here and alcohol consumption was strictly prohibited. The locals narrated to us how the legend goes about the local deity having appeared one night who forbade all of them from consuming alcohol from that moment onwards and there was another surprising fact which left us giggling. The people of Grahan comprised descendants of two families. So, you were supposed to marry a member of the other family and nobody else! Well, you cannot deny the traditions every place carries and it was a pleasure having met all the lovely people, anyways! We took shelter in one of the guesthouses which had cozy mattresses and we instantly fell asleep as soon as our heads touched the soft pillows. Owing to the strenuous path which we had taken, we thought it would be safe to leave early the next morning. Content and happy, we decided to call it a night!